Description: Perennial to 1 m high with a tough rootstock. Leaves with ligule a ciliate rim; blade 2–8 mm wide, flat, scaberulous; sheath scaberulous to smooth. 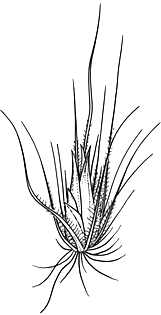 Panicle spike-like, moderately dense, 2.5–15 cm long; bristles numerous, the outer very slender, about as long as the spikelets, inner slightly stouter. Spikelets 1–3 per cluster, acute, 3.5–5 mm long, usually glabrous. Lower glume 2–3 mm long, nerveless or 1-nerved, acute to acuminate; upper 2–3.5 mm long, 1–3-nerved, mucronate. Lower lemma male or sterile, rarely bisexual, c. 3.5 mm long, obtuse, usually 5-nerved; palea about as long as lemma, or suppressed. Upper lemma bisexual, c. 4 mm long, 5–7-nerved; palea subequal to lemma. Distribution and occurrence: Grows mostly on sandy soils, planted for pastures, and for erosion control. Native of N Hemi.